It is an animation of an electric arc between two fixed points with a wide set of parameters that allows you to adjust the discharge appearance and movement. To change the arc length and orientation, left click and drag its end points in the view window. End points are marked with blinking squares that appear only if the electric discharge animation is selected in the animations list. This tab contains controls for the object geometry and animation. Width - sets the width of each segment and the width of glow around them. Segments - sets the number of segments in the arc. Deviation - sets the maximum distance of the arc from a straight line. Higher values make the arc more folded. Speed - sets the speed of the arc motion. Steadiness - controls the smoothness of arc fluctuations. Lower values make movement jerkier. 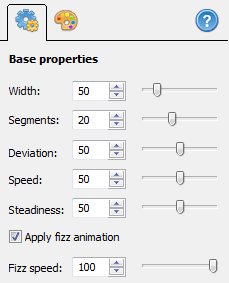 Apply fizz animation - adds additional animation on each segment. Fizz speed - sets the speed of additional animation. This tab contains controls for the color of discharge and its glow. Main color - sets the color of the central part of the discharge. Translucency - sets the opacity of the central part of the discharge. Glow color - sets the color of the glow around the discharge. Glow size - sets the strength of the glow effect. 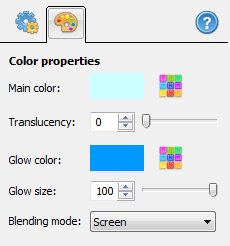 Blending mode - sets the color blending algorithm for the glow effect.